A rough economy boosts ingenuity and shows intriguing new propulsion models, including this brilliant circular wave combustion system, perfect for extending plug-in hybrids’ range. When the economy takes a turn for the worse, suddenly somnolence is rudely interrupted and engineers and scientists alike are allowed to dive in deeper into revolutionary propulsion systems. A circulatory combustion engine system conceived by Dr. Norbert Müller from the Michigan State University has received the backing from the US Government with a $2.5 million fund. Hat tip GizMag. Dr. Norbert Müller’s Circular Combustion Engine. It looks like a sundial from ancient Greece but serves an even more practical purpose, that of burning fuel efficiently. Halfway between a turbine and a Wankel rotary engine, this ingenious rotary combustion wheel shows great potentials to extend the range of plug-in hybrids. Technically Speaking. The spinning metallic disc incorporates precise radial channels where a mixture of fuel and air comes in through the hub. It then travels to the radius, gets compressed, ignited and then released. The ignition spins the wheels, which can be hooked to a generator and power a plug-in hybrid. The expansion of the explosion spins the wheel, which opens the inner channels for the intake and expulsion of gases. 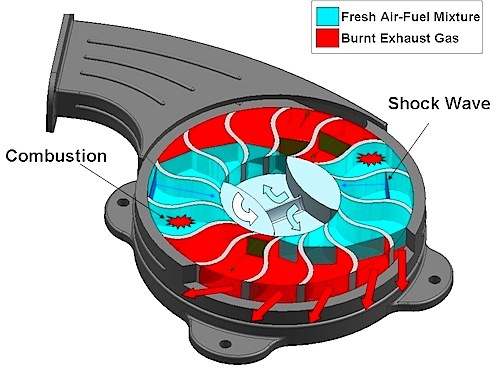 Much as a 4-stroke cycle, the exhaust gas is expulsed and once more the mixture of fuel and air is sucked in the channels back for a cycle. Efficiency At Heart. The efficiency of such as system is due to the fact that it encounters very little resistance and friction. With fewer moving parts than a conventional internal combustion engine, ICE, fuel consumption is typically lower. Dr. Müller’s efficient design reduces fuel economy by 60% with his wave disc design. Add to it a substantially lighter weight and the engine becomes a natural to extend the range of plug-in hybrids. According to Dr. Müller: "Our goal is to enable hyper-efficient hybrid vehicles to meet consumer needs for a 500mile driving range, lower vehicle prices, full-size utility, improved highway performance and very low operating costs. The WDG (Wave Disc Generator) also can reduce carbon dioxide emissions by as much as 95% in comparison to modern internal combustion engine vehicles." Although this design lends itself well to other applications, such as portable generators and more, a car version of it producing 33.5hp, 25 kW could be out by the end of the year. The following video of Dr. Müller somewhat explains the design. While this system is not new per se, it does offer a potential use for future plug-in hybrids. Still, one has to wonder what the efficiency and performance differences are compared to a finely tweaked turbine. In the meantime, we can only welcome engineers and scientists’ uncanny ways of thinking outside the box, bringing us a circular combustion engine that could extend the range of plug-in hybrids. This is one of those ideas that keeps cropping up once in a while. This particular group has been working on this for a few years now, I believe. It's a theoretically sound idea, but I don't think it's actually been done in practice. Two Words - Sterling Engine. Yes, John, it is a take on the Sterling Engine. This is what I like best about all these "revisited" or improved systems, it's the wide array of choice. A Sterling engine still operates via reciprocating pistons. That process is the heart and soul of the gross inefficiency of 99.xxxx% of existing internal combustion engines. Every cycle of any form of reciprocating. engine's piston / piston pairs absolutely require that the engine beat inertia into submission twice to 4 times per combustion event. Most of the force the combustion generates is thereby lost to the reciprocation process and completely unavailable for drive shaft rotation, the whole point of employing any such engine! I consider the reciprocating engine the most effective driving force for the progression of the lemming herd of humanity towards the cliff edge of atmospheric survivability obliteration. You're right William but since carmakers are geared with piston engine technology, at least this moves things along in a better direction then the tired and old conventional piston system. Actually, I was wrong in that I now believe you were referring to the Sterling effect or principle which is at least close to what this uses. I was narrowly associating it with most of the Sterling engines I've seen articles on in the past which typically employed ganged piston pairs, slave and drive.Mea culpa. The Cyclone Power external combustion engine that empowers a steam driven piston system is already in use by the military. Search the name here at TorqueNews. That engine seems a natural as a generator engine for the Volt. Hybrids, on the other hand, could be replaced by the Scuderi or the Tour Engine that uses the split-cycle technology with air-hybrid option. Steam and hydraulic are still being used to this day. In fact, there are a few patents that were dropped the last few years on both systems relating to car propulsion. While I like to see all these technologies, the bottom line is what can companies actually do with them. If you are tooled to produce pistons and cylinders, would a company adopt any of these different technologies? I'm afraid it's a bottom line game. Based on your position, then the split cycle engine is an easy chip shot. Fact is, split cycle uses the same pistons and cylinder mfg process of the OEMs, just with different intake and timing devices. The ECE by Cyclone also uses pistons. The fuel is merely fired on an open (external) chamber, then transmits its energy to the closed loop steam syeam which drives the pistons. Hi Frank, I'm not sure what you mean by: "Based on your position, then the split cycle engine is an easy chip shot" I don't think any current technologies are cheap shots, if that's what you meant. I feel the more choice, the better the industry is. However, the automobile industry has shown us many times before that it will choose the path of least resistance. Since they are tooled for pistons, it would be interesting to see which one, if any would go these new technologies. In fact, I think Mazda's new SkyActiv technology is amazing. That's easy as in chip shot; as in golf? LOL. I know it looks like the greater the choices the better, but too many makes it difficult, too, to choose for the OEMs, when they need commonality to the degree that it reduces industry cost. Your assessment of OEMS choosing the path of least resistance is right on, hence their choosing baby steps over quantum steps with the ICE. The Volt propulsion therefore looks like far-out by comparison. Fact is, the split cycle is not that far out from what they are doing right now, though. I view it as the next evolutionary stage in the 4-cycle ICE. That Cyclone Power engine would be an ideal generator engine for the Volt, for example. It has the power and the through burning of the fuel all in one. That makes me ask: Will this new engine that this article decribes be capable of suficient torque to drive a car directly? Or is it more for generator turning? Gotcha! Yes, it's difficult for a big company to take bold steps, especially when you have capricious shareholders who demand nothing but ever growing ROI. But you're right, a split cycle is close to a 4 stroke and shouldn't be that far off for them. The Cyclone engine or disc, as in this case would make for finely tuned generators. I don't see them spinning wheels directly, since their torque is probably minimal. It wouldn't work in Volt, since the gasoline engine drives the wheels at time. I also fee a turbine is a great choice, plus it's a mature technology. As a bottom line item, the vastly fewer parts this employs should make the engine assembly re-tooling hugely more simple than for different recip. engines. Less than half the stations on the line! I like the idea of a circular engine, whether Wankel or disk, who cares sicne it can be tweaked to be as efficient as possible for a plug-in hybrid. Engine. . . . [S]ome would rather see internal combustion engines abandoned outright than spend money, time and effort to improve them with hydrogen. But there are benefits in doing so, and maybe we ought to think about them. First, using hydrogen in our vehicles now will increase demand for it, and thus hasten the setting up of the hydrogen infrastructure which will be needed for fuel cells. Second, the increased use of hydrogen will streamline the way it is made or transported, and therefore drive down its cost. And as an added bonus, it will makes us more comfortable around hydrogen, and alleviate current fears of explosion. Third, using hydrogen in our internal combustion engines now may salvage a century's worth of tooling investment in them, as well as in the transmissions, axles, etc. Whether we like it or not, all these will be around for a while, so we might as well make them efficient while they are with us. Fourth, using hydrogen to improve the mileage of our cars, trucks, boats, and airplanes, should reduce our need for foreign oil, air pollution, and greenhouse gases. This may seem impossible since hydrogen is now made predominately from natural gas. However, we are presently implementing plans to make hydrogen from electricity at hydro-electric plants, geothermal plant, nuclear plants, and from electricity derived from the sun and the wind. Moreover, we are trying to make hydrogen from methane in farms and waste dumps; and directly from sewage, bacteria, seawater, and most promising, sunlight itself. Fifth, since hydrogen increases the thermal efficiency of fossil fuels across the board (gasoline, diesel, alcohol, liquefied coal, coal, methane, and natural gas) mixing it with these fuels should improve the efficiency of furnaces, water heaters, boilers, jet engines, and perhaps even the natural gas or coal electric generators themselves. Sixth, a greater use of hydrogen will hasten its implementation for storing energy in a pure and potent form. Just like we can store electrical energy in batteries, we can also store it by converting into hydrogen in a tank. Once there, the hydrogen can be used when needed, and where needed. Moreover, metal hydrides, nanotubes, or even cheap charred chicken feathers, can store hydrogen at low pressure, and can make it possible to ship huge quantities of energy in the form of hydrogen to remote corners of the earth. Natural gas (methane) is the most common source of hydrogen right now, and for good reason. It has a 1:4 H2:carbon ratio and because of this, can be used in fuel cells in much the same way hydrogen is used. It can also be injected into liquid fuel systems (gasoline, diesel) to boost productivity and efficiency. It's also widely available nearly all over the nation with generally local sourcing. It can also be compressed easily (just cool it down and it compresses on its own - GE is working on a system to do this in the home for $500 - even in non-liquid form) and more. Compared to hydrogen, for the near term, NG is a much more viable option. For the longer term, perhaps something else is a better solution. I'd like to see a version of this in something I've been considering buying for my home. That's a home stand-by generator. Imagine the improvement in efficiency this would provide over the current reciprocating natural gas or propane engines in the operation of such a generator installation! Of course we're talking of a size for output of ~ 10-20 KW, significantly smaller than referred to in the video. I wonder if the highly variable load minus batteries to stabilize output load would be a problem? Hi William, let us know if you decide to go forward with your generator idea.